Hint – Bulk and Skull. I can’t believe I actually took this show seriously. Congrats to Grant Lee on being the lucky winner of the Miles Plumlee 2012 Leaf Basketball Auto. 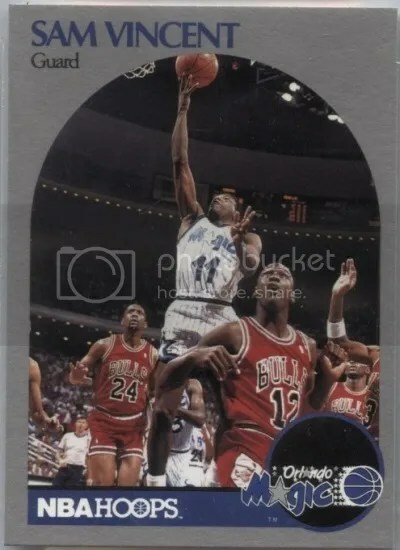 Once Grant Lee sends me his mailing address, I will ship this card ASAP. Thanks! 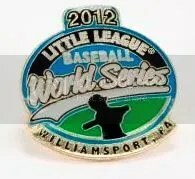 The 2012 Little League World Series will soon take over South Williamsport once again. Pins will be flowing like water. If your a pin collector, especially baseball ones, this is the place to be. This ten day long baseball and pin extravaganza starts August 16th and goes until the 26th. I’ll probably head up there one weekend to see what kind of promo pins I can snag. You have to admit, the above pin is hilarious. A Little League pin designed to look like a shot glass. Anyone else find this funny? Perhaps next year we’ll see some Little League World Series pins featuring the Marlboro Man. This is a district pin and probably isn’t endorsed by Little League officials. I guess you could drink anything out of a shot glass, but one usually makes you think of alcohol. These pins are selling for $5.00 to $12.00. The Little League World Series is a pin collector’s paradise (especially if your a baseball fan). Almost anything you can think of that deals with the LLWS has a pin. Some of the most sought after pins are the ones that come from individual districts. 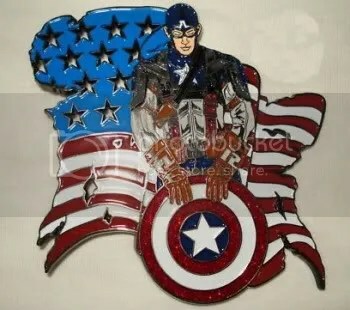 The above Captain America pin comes from FL 12 and is quite large, measuring up to 4″. There are a few variations, and one that even glows in the dark. They have been selling for $20.00 – $30.00 a piece.